*The following fields are required and must be filled in. 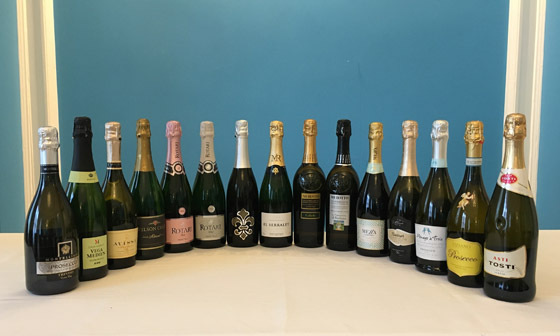 The Fifty Best held a “blind” tasting of recent release sparkling wines with 11 pre-qualified wine judges. Strict tasting rules were applied. The order of service was established beforehand by lottery. The flavored sparkling wine was tasted and scored separately. Each of the sparkling wines were poured into fresh glasses from new sealed bottles and served well chilled. Only ice water and peasant bread were available to cleanse the palate. The judges wrote down their impressions of each wine on score sheets. The scoring was done on a 5-point system, with 5 as the best. Double-Gold, Gold and Silver medals are awarded according to a set range of final point scores received from the judges. There were no bronze medals awarded for this tasting. The tasting notes that follow are summaries of the judges’ opinions, with all replicated commentary eliminated. Prices indicated do not include tax. Aroma: Peach, white peach, apricot, dried peach, strawberries, citrus, floral, hints of rose, minerals. Palate: White peach, peach, raspberries, strawberry, white cranberries, red grapefruit, lemon, pear, Granny Smith apple, crisp, brioche, refreshing, fantastic mousse. Finish: Brioche, baked bread, clean, crisp, fresh, nice, soft, elegant, delicious. This wine was made from a blend of Chardonnay (25%) and Pinot Noir (75%) grown in Italy’s Adige region (just north of Trento). Following initial fermentation, the wine underwent a secondary fermentation (to produce the bubbles) in the final bottle over a period of 24 months on its lees (wasted yeast). Aroma: Apple, tart berries, raspberries, black currant, lime, tangerine, melon, rose, forest floor, toast. Palate: Apple, pear, peach, plum, tart strawberry, citrus, tangerine, pink grapefruit, vanilla, flowers, mineral, bone dry, vibrant mousse and acidity. Finish: Red apple, berries, crisp, clean, smooth, balanced sweetness and acidity, very well balanced, surprisingly refreshing. For this wine, Glera grapes grown in the Friuli Grave area are gently crushed and fermented in steel tanks, with a secondary fermentation in tanks (to produce the bubbles) and 120 days of maturation. Aroma: Red apple, apricot, melon, mandarin orange, lime, grapefruit, elderflower, toasty, yeast, stones, chalk, slate. Palate: Golden apple, green apple, pear, apricot, citrus, tangerine, tropical fruit, white flowers, ginger, vanilla, mineral, toasty, tangy, light bubbles. Finish: Tangerine, citrus, bread crust, earthy, mineral, touch of acidity, crisp. This wine was made from 100% Glera grapes grown totally in the traditional Prosecco area (Veneto) and processed by the Charmat method (in which the secondary fermentation to produce the bubbles takes place in a pressurized tank). Aroma: Lemon, lime, grapefruit, tangerine, citrus, peach, tropical fruit, vanilla, creamy, pastry, baked bread, toast, mineral. Palate: Lemon, lime, white grapefruit, citrus, pear, white flowers, elderflower, very balanced fruit, rocks, high acidity, fine mousse, fresh tiny bubbles. Finish: Apple, pear, lime, white grapefruit, citrus, good balance of sweetness and acidity, crisp, pleasant, elegant. This wine was made with 100% Glera grapes grown in the traditional Prosecco area (the Veneto Region between the Dolomites and the Adriatic Sea) and fermented to have 11.5% alcohol. Aroma: Green apple, apple, peach, lemon, lime, floral, wet grass, almond, vanilla, pronounced. Palate: Apple, pear, lime, tangerine, banana, vanilla, creamy, biscuit, toasty, diced herbs, vibrant acidity and mousse, balanced. Finish: Sweet apples, lime, mineral, very lean, crisp, clean, smooth, sweet approach and touch of acidity, vibrant, complex, fine bubbles, very nice. Made from 100% Chardonnay grapes grown in Italy’s Trentino Alto Adige region, the secondary fermentation (to produce the bubbles) took place in the final bottle over 24 months, with the wine resting on its lees (wasted yeast). Aroma: Green apple, apples, pear, plum, citrus, mineral, yeast, bread, clean. Palate: Green apple, pear, cherry, melon, grapefruit, tangerine, dried apricot, hazelnut, bread dough, toast, mousse, earthy, steely minerality, vibrant acid. Finish: Green apple, lemon skin, ginger cookie, chalky, crisp, complex, excellent balance, nice for a summer party. Aroma: Golden apple, apple, pear, peach, lemon, lime, tropical fruit, jam, floral, honeysuckle, dandelion. Palate: Golden apple, pear, peach, nectarine, cherry, lime, grapefruit, vanilla, honey, white flowers, mineral, sweet and sour. Finish: Pear, lemon, lime, elderflower, bready, yeasty, crisp like an Asian pear, tart, balanced, pleasant, elegant. Only a small portion of the Glera grapes used for production of this wine were from outside the traditional area for Prosecco. To enhance the quality of the wine, it went through a 60-day secondary fermentation (as compared to 30 days for most Prosecco wines) and the wine was aged on its lees (wasted yeast). Aroma: Golden apple, apple, cherry, lemon, melon, tropical fruit, floral, wet stones. Palate: Golden apple, lemon, lime, pomelo, citrus, citrus pith, bubblegum, sandalwood, dough, yeast, saline, mineral, strong mousse, fresh bubbles. Finish: Lime, dried apricot, creamy, smooth, mineral, clean, crisp, good food wine, refreshing. This wine was fashioned from 100% Glera grapes grown in the vineyards of Col San Martino and Pieve di Soligo. Following a soft pressing and primary fermentation at controlled temperatures, the wine underwent a secondary fermentation in pressurized stainless steel tanks for 40 days. Aroma: Green apple, apple, pear, apricot, pomelo, tangerine, orange, lime, key lime. Palate: Golden apple, green apple, pear, peach, melon, lime, grapefruit, dry ginger, honey, crusty bread, fresh, slight acidity, light mousse. Finish: Lime, ginger, honey, toast, mineral, clean, crisp, wonderful effervescence. This wine was produced from Xarel-lo and Macabeu varietals harvested from the hillsides of Saint Sadumi d’Anola. Each varietal was initially fermented separately, with the secondary fermentation (to produce the bubbles) taking place in the final bottle. Aroma: Apple, lemon, citrus, floral, vanilla, toast, bread, yeast, mineral. Palate: Apple, peach, lemon, grapefruit, bread, toast, barrel, tannins, earthy, mineral, light mousse, long-lasting bright bubbles. Finish: Citrus, mineral, stones, earthy, deep soil, fresh, clean, well balanced, some complexity, pronounced. Grapes for this wine (50% Chardonnay, 50% Macabeo) hailed from the municipality of Requena (in the Valencian area of Spain) and the wine was produced using the traditional “cava” method in which the second fermentation takes place in the final bottle. Aroma: Golden delicious apple, lemon, citrus, lemon juice, grape, vanilla, floral, almond, bread, yeast, mineral. Palate: Green apple, apple, pear, lychee, citrus, lemon, almond, dusty, mineral. Finish: Lychee, wet stones, woody, smooth, crisp, good acidity, silky texture with fine bubbles, elegant. Grapes for this wine (60% Chardonnay, 30% Pinot Bianco, 10% Muller Thurgau) were harvested in the Trento Alto Adige area, at the foot of the Dolomites. The wine was first fermented in temperature-controlled stainless steel over 10 days and underwent a second fermentation in temperature-controlled tanks, and then maturation for 3-5 months on its lees (wasted yeast) before cold stabilization, filtration and bottling. Aroma: Green apple, golden apple, pear, peach, apricot, citrus, melon, lychee, floral, magnolia, almond, yeast, bread crust, fresh, crisp. Palate: Pear, peach, melon, grapefruit, white flowers, summer flowers, elderflower, herbal, grassy, stones, light mousse, bone dry. Finish: Lemon, lime, citrus, flower petals, sweet fruit with a touch of acidity, balanced, soft, smooth, refreshing. Grapes for this wine hailed from the hills of the Trevisio provence, with fermentation of grapes by the Charmat (tank) method for producing bubbles. Aroma: Apple, green apple, golden apple, pear, peach, pineapple, lime, white flowers, mint. Palate: Green apple, apple, sweet pear, apricot, peach, tangerine, floral, white flowers, spearmint, caramel, hazelnut, tart, silky. Finish: Green apple, bubblegum, tart, great fruit expression, touch of acidity balances out sweetness, low mousse, pronounced, fresh, clean, smooth. This wine was made from 100% Glera grapes from the traditional Prosecco area in the Veneto, by the Charmat (tank) fermentation method to produce its bubbles. Aroma: Golden delicious apple, tropical fruit, lemon, citrus, grassy, wet stones, white cake dough. Palate: Lemon, lime, tangerine, nectarine, banana, elderflowers, white flower nectar, mint, honey, like a pinot grigio, light mousse. Finish: Green apple, pear, grapes, fruit pit, creamy, mineral, clean, refreshing. Aroma: Apple, pear, peach, lime, 7-Up, honeydew, lychee, compote, banana cream, honey, floral, almonds. Palate: Apple, green apple, Bartlett pear, peach, apricot, lychee, white concord grape, floral candy, elderflower, large bubbles. Finish: Honey crisp apple, grapefruit, tangerine, concord grape, bread, yeast, dough. sweet, clean, soft. This wine was naturally fermented with a small amount of pure almond extract added. Aroma: Apple, peach, citrus, sweet candies, vanilla, marzipan, almond, bitter almond, almond paste. Palate: Almond syrup, apricot, peach, lime, white flowers, almond, marzipan, ginger bread, ginger ale, powdered sugar, tiny bubbles. Finish: Strawberries, lemon, tropical fruit, cake mix, almond, marzipan, confectioner’s sugar, crisp, light mousse, refreshing. Disclaimer: This section of the website is intended for visitors 21 years of age and older. If you are not of legal drinking age, please exit by clicking here.